Yill mobile energy storage unit. Yill is a small 1kWh energy storage unit that can power a modern workstation for two to three days without cords or cables. 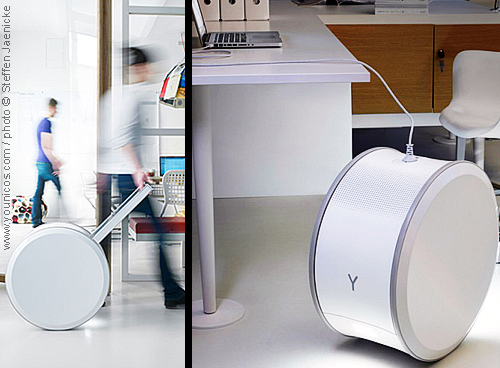 The wheel-shaped design with a retractable handle allows you to move and power up anywhere. This makes the layout of a workplace extremely flexible. Teams can form quickly and easily where they are needed, even in older buildings or factory lofts. Yill stores energy in a rechargeable lithium titanium battery, which is extremely safe, recharges quickly and has a long operating life. It has a nominal power of 300 Watts. It would be great if the movement of the wheel could also help to recharge the battery! !